Throughout the late '70s and early '80s, Italy conducted a love affair with zombie movies. Impaled eyeballs and maggot-ridden faces abounded. Subtlety made few appearances. However, subtlety wasn't completely absent. For evidence, check out Zeder (1983), one of the most unusual zombie movies to come from Italy during this Dawn of the Dead-inspired onslaught. As Stefano investigates the cryptic message left on the typewriter ribbon, he soon encounters people who don't like him asking any questions about Paolo Zeder or K zones. The resistance he encounters only fuels his desire to get answers. Eventually, his investigation leads him to a strange, abandoned property, now protected by electrified fences. A nearby service station attendant says French investors are building a huge hotel on the property, but we never see any work being done. The movie's audience is privy to more information than Stefano. In the movie's opening scene, we see a zombie rise from the ground, and soon afterwards, we see the mangled body of an old woman attacked by the zombie. A team of scientists descends on the town where the murder took place and they investigate the murder site. Stefano has no idea what he's getting into, but the audience knows and that increases the suspense quotient by several fold. But Avati doesn't give everything away. He keeps plenty of surprises up his sleeve. For example, when Stefano sneaks onto the abandoned property, he discovers surveillance equipment. Monitors show the face of a man buried in a coffin. Stefano watches the monitors. Why are cameras trained on the face of a dead man? And then we find out--in a truly chilling scene. Avati also directed the highly-regarded thriller The House With Windows That Laughed ("La Casa dalle Finestre che Ridono"). While his horror/thriller movies are among the best to come from Italy, Avati has always acted embarrassed about his genre contributions. However, there is little to be embarrassed about in Zeder. It's not a perfect movie. The movie's final developments, in particular, aren't convincing: Stefano decides [SPOILERS COMING] to use a K zone to bring his own wife (Anne Canovas) back to life (as would happen in Stephen King's Pet Sematary), but the movie only makes a weak case that Stefano would attempt such an act. His attachment to his wife is so weak that he eagerly abandons her so that he can investigate Paolo Zeder's cryptic essay. And now he's so obsessed with bringing her back to life he willingly turns her into a zombie? Nope, there's not much logic there. 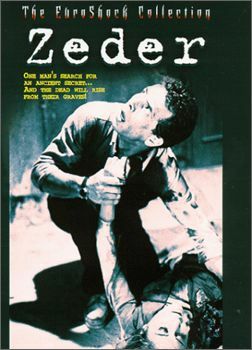 However, while Avati emphasizes mystery and suspense, Zeder is one of the most unnerving horror movies ever created. This new DVD release from Image Entertainment contains no extras, just the movie itself in an English-language dubbed version. And the video transfer isn't ideal: it was created from a slightly worn and faded print. But it's exciting to be able to see this movie in any form. Zeder is now available on DVD from Image Entertainment. It's part of "The EuroShock Collection." Suggested list price: $24.99.